One of the most beloved writers ever, though he died young in poverty. One of the most quoted poets in the English language, though most of his poems in Scottish dialect are incomprehensible to many English speakers. Much of his work is nothing more than lyrics written to folk songs. Few of his writings broke any new ground in poetic techniques. He used many of his turns of phrase—often clichés and slang of the day—over and over. Yet the name of this largely self-taught versifier has lasted these two centuries and more. His following still verges on the fanatical. Why is that? Perhaps partly due to Caledonian pride and nationalism. Robbie Burns is considered Scotland's national poet. He often wrote about the struggle of the Scots against their British or other foreign overseers. But his appeal has been much wider than that, as many nations have claimed him as their own. In Russian, for example, he has been considered the "people's poet" and his works treasured—both long before and after the 1917 revolution. Maybe it's because of his passion. His heart went into his poems and songs, which seem to speak fiercely not just for the Scots but for the downtrodden everywhere, for common folks whose daily lives and destinies are caught up in the machinations of higher classes of lords and landlords, kings and ecclesiastics. But Burns may be likened to the broad rolling plains of mankind's triumph and travail. For here mankind weep and mourn, sing and rejoice, are born and beget their kind and die. In every stage of the journey from the cradle to the grave, Burns is triumphantly articulate. 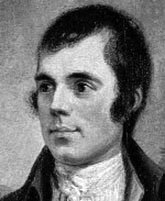 Robert Burns was born in Alloway in Ayrshire, Scotland, the son of a poor farmer who nonetheless gave his sons a good education for the time. At age twenty-four, upon his father's death, Burns and a brother bought a farm, which went to ruin despite their hard work. Around the same time Burns became involved with Jean Armour, the love of his life whom he eventually married and had many children with, despite a series of entanglements and children with other women (all memorialized in poetry). He also began publishing his poems, which had previously circulated only in manuscripts, in hopes of making enough money to emigrate to Jamaica. The enthusiastic reception of the Kilmarnock edition of Poems, Chiefly in the Scottish Dialect (1786), however, led him to move to Edinburgh. An enlarged Edinburgh edition of Poems came out in 1787 and he toured Scotland in triumph as the national bard. However, he was still impoverished and held several jobs while producing his poems, including the famous "Tam O' Shanter" (1791). He also worked unpaid at setting lyrics to hundreds of Scottish songs to save them from extinction, including what we know as "Auld Lang Syne", "Comin' Thro' the Rye", "Ye Banks and Braes" and "(My Love's Like) A Red, Red Rose". His outspoken support of reform almost led him to being tried for treason and exiled to Botany Bay, and some of his work, notably the song "Scots, Wha Hae", proclaiming to his countrymen "Liberty's in every blow! Let us do, or die! ", had to be published anonymously. He died of rheumatic fever at age thirty-seven. His birthday, January 25, is celebrated all over the world as Burns Night.